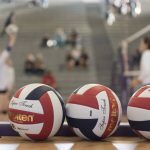 Varsity Volleyball · Apr 2 New Volleyball Coach!!! We are excited to announce that Francis Farani has accepted the head volleyball coaching position for the upcoming fall season. Coach Farani comes to East with a lot of experience playing and coaching at different levels. As an athlete she excelled in multiple sports and hopes to help her players do the same. Coach Farani was able to meet with some returning players before spring break and there was so much excitement that she organized some workouts over the break to get to know each other better. She is putting together an off-season schedule to make sure the team is ready to kick-off the 2019 season on the right foot. Look for more information about upcoming volleyball events soon.